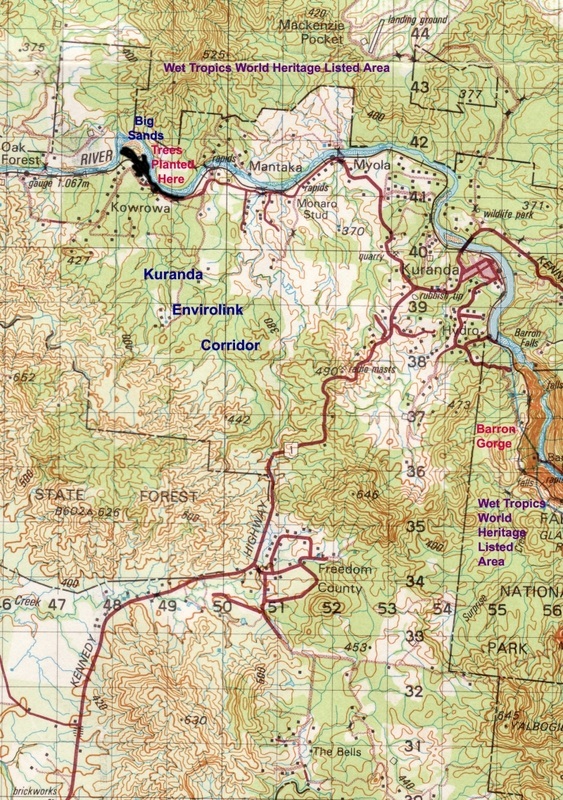 This map shows the residual rainforest vegetation that makes up the Kuranda Envirolink Corridor, which connects the areas under World Heritage protection to the north and south east of Kuranda. The Barron Gorge acts as a barrier to the movement of wildlife within the Wet Tropics World Heritage area, hence the importance of the corridor as the only remaining link for a number of species, including the endangered Southern Cassowary. Initially, Kuranda Envirocare’s tree-planting was focussed on the banks of the Barron River at Big Sands, where the Envirolink Corridor was badly degraded by clearing, fire and weed infestation. The area planted is marked in Black on the map. Grid lines are 1 km apart.